The Matrix A50 Suspension Elliptical Trainer is On Sale! The latest technology was used on this Matrix suspension elliptical to provide instant, smooth, and precise resistance changes with the push of a button. The Matrix A50 is the ultimate ascent trainer from the fastest growing commercial brand in the world. This machine also features 30 resistance levels, 20-24” variable stride length, a low step up height of 8.7”, and a choice of three different console designs. Matrix ellipticals are manufactured by Johnson Fitness located in Madison, Wisconsin. This company is also responsible for Horizon and Vision machines. They are known for their quality machines that have few maintenance issues. They manufacture all of their machine components which results in machines that operate smoothly without problems associated with third party parts. 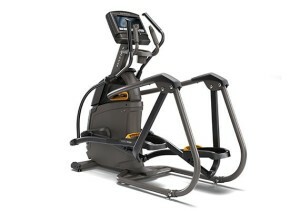 WEEKEND SALE ENDS MONDAY: The Matrix A50 Elliptical is on SALE! The Matrix A50-XR is typically priced at $2,999, the Matrix A50-XER is typically priced at $3,499, and the Matrix A50-XIR sells for around $3,999. Pick the console that works best for you! We also suggest you check out the Life Fitness E3 for premium quality. 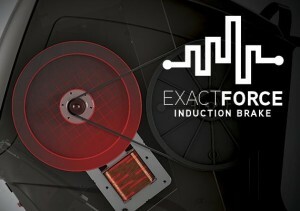 Exact Force Induction Brakes – This type of resistance system is more precise than the ECB system used on most other elliptical models. It uses electricity to create a magnetic field with no moving parts. The result is a durable and quiet machine that provides instant resistance changes at the touch of a button. Suspension Elliptical Design – The wheels and tracks on traditional ellipticals can be noisy and uncomfortable. In contrast the suspension elliptical design on the Matrix A50 provides a quiet and smooth ride. Power Incline 24-54% – The best thing about an ascent trainer like this is the ability to crank up the incline and work your glute muscles. 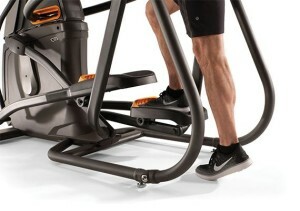 Most other ascent trainers raise the user higher off the ground when a steep incline is engaged. The Matrix A50 doesn’t do this so you don’t need to worry about putting this machine in a room with a lower ceiling. 20-24” Variable Stride Length – The Perfect Stride system from Matrix Fitness allows for ideal stride motion and ergonomically correct foot position for a smooth and natural workout. We like the feel of this machine! 8.7” Step-On Height – A low step up height is good for older users. It is easier to mount this machine than some competition models with a rear drive system. Warranty – This machine comes with a strong warranty that reflects the confidence from the manufacturers. It has a lifetime frame warranty along with 7 years parts and 2 years labor. Matrix machines have a trio of tech that lets you get fast effective results from your workouts, track your progress, and enjoy virtual landscapes while you sweat! Sprint 8 – Dr. Phil Campbell developed this program so that users could be guided through a high intensity interval training (HIIT) program that would deliver fast results with minimal workout time. A scientific study showed that participates lowered their body fat percentages, improved cholesterol, experience increases in energy and showed positive changes in bone density after their eight week program. Sprint 8 is built into the XER and XIR consoles so you can begin your workout without additional materials. Go to www.sprint8.com to learn more. ViaFit – Many of us already use fitness tracking apps on our phones or use wearables like FitBit to record our stats each day. Wouldn’t it be nice if all of this information could be collected in one place for easy viewing? 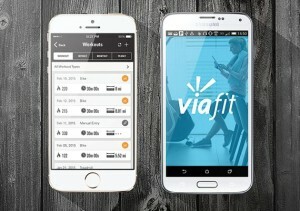 The ViaFit platform from Matrix does exactly that while incorporating information from your elliptical workout. You can set goals, track progress, and even join online challenges using your free account. Virtual Active – Let’s face it, spending hours each week on the elliptical can become boring after a while! The Virtual Active program battles this boredom with the addition of filmed courses that transport you into fun locations around the world. The XER and XIR have the program built in so you can view your course directly on the elliptical display. 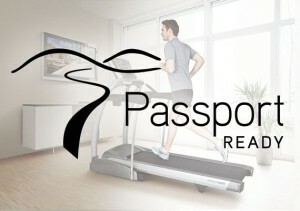 Or, you can purchase the Passport Player to view your course on a TV screen with any one of the three console options. Additional courses can be purchased and uploaded via thumb drive. Why pay for features you won’t use? With the Matrix A50, you have a choice of three different consoles with varying levels of tech so you are only paying for the features you truly want. XIR – The top level console comes with the Matrix A50-XIR for $3,999 and includes a luxurious 16” HD touchscreen. We’re not trying to be dramatic. It’s just a really nice screen! The apps are laid out like they would be on a smart phone so you can easily select and view programs like Netflix, Facebook, or a Web Browser. The XIR console also has all three tech features highlighted above: ViaFit, Virtual Active and Sprint 8. XER – If saving $500 sounds attractive to you, then you can enjoy all of the same tech features on a slightly smaller screen with the Matrix A50-XER. It comes with a 10” touchscreen. XR – Finally, you may want to save an additional $500 for the basic option of the Matrix A50-XR. This display has an 8.5” extra wide blue back-lit LCD screen with regular stats like time, speed, and resistance level. It does not have all of the tech options of the first two, but you can still use ViaFit and the Passport to run virtual courses displayed on your TV. The Matrix A50 is a fantastic ascent trainer from a great company. We really liked how the power incline feature allowed us to vary the incline. Plus, the choice of three consoles provides the buyer with a unique option to only pay for the tech they plan to use. The main drawback of this machine is its size at almost 75”. If you’re looking for a smaller machine, you might want to check out the Matrix E50. You will need to sacrifice the incline feature though. The Exact Force Induction Brakes on the A50 are really nice to provide instant resistance changes however you may be perfectly happy with regular ECB brakes. In which case, you should also check out the Matrix A30. In the end, you can’t go wrong with a suspension elliptical from Matrix. They are really nice, quiet, and smooth riding machines that will deliver a great workout.